Cre8ive Cutz - 3D SVG Cutting Files for Electronic Cutting Machines: Welcome to Cre8ive Cutz! I am very excited to be bringing you tutorials and information about cutting with your Cricut electronic cutter, as well as cutting files that can be used with Make the Cut or Sure Cuts a Lot software. Would you like to know a little bit about me? I am a paper turned digital scrapbooker. When I decided to take up digital scrapbooking (which I love for a lot of reasons) I missed the hands-on aspect of paper scrapping. I was invited to a Stampin' Up party a friend was having, and discovered the wonderful world of cardmaking. Since then, I've tried all kinds of cardmaking techniques, and recently purchased a Cricut machine to expand the possibilities of what I can do. I also love making mini-albums, and my Cricut is the perfect companion for that as well. 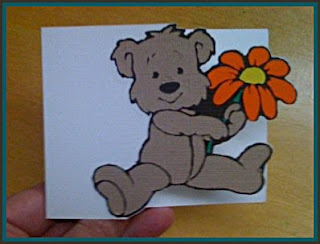 Here's a photo of a cute little greeting card I created using my Cricut and Make the Cut. I plan to share some of my projects with you, as well as lots of other fun stuff. Stay tuned! Very cute card!! I love that bear!!! Was that a "print and cut" or was that a cut file?? @Dee H: he is a cut file created from a "dingbat" font. Lots of little pieces, but he was fun to put together. What is an SVG Graphic?